With the days getting longer and warmer, I find myself looking out the window thinking about what to plant in my garden. I usually decide what to plant by choosing things that I like to eat, or things that grow well in my location. This year I decided to look at garden planting strategy from an economic angle. 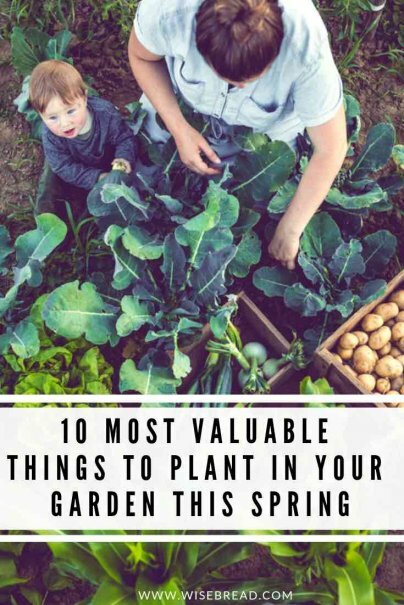 Considering the value of the produce, the likely amount of production, the garden space required, and the general desirability of the produce, here are the 10 most valuable things to plant in your garden this year. Since garlic is one of the most expensive produce items to buy in-store, growing it yourself is a much better plan. Whether you're buying the full cloves, the striped cloves that are pre-washed, or the pre-minced garlic, you're paying way more for this plantable item than necessary. To save even more money on your garlic harvest, you can grow it as a perennial, and not have to replant it every year. Cilantro can be a relatively inexpensive item to buy, but how often do you use up everything you buy? It is also a plant that produces the highest dollar value per square foot based on typical production in good growing conditions. Cilantro is an annual, but it seeds itself so well that you might think it is a perennial. Whatever green, leafy base your favorite salad requires, you would be wise to grow it yourself this spring. Spinach, mixed greens, and lettuce are all quite pricey in the produce aisle. You're usually paying for convenience with these items, so they're often found bagged or boxed, pre-washed, and free of stems. But if you plant them yourself, along with arugula and Swiss chard, you'll get the most value per square foot. Plus, you'll know exactly what you're getting and just how clean it is. Like garlic, chives are a perennial plant, so you only have to plant once and can count on it growing back every year. It's also another produce item found on the list of crops that produce the highest dollar value per square foot based on typical production in good growing conditions. There's something particularly satisfying about biting into a juicy tomato you grew in your very own garden. And since cherry tomatoes are small, you tend to go through them quickly. You'll no longer be paying top dollar for each box when you can pick what you need from your garden. Instead of shucking store-bought peas, why not experience the pride of shucking peas that emerged from the ground outside your house? Freeze the surplus from your harvest and you'll have peas to use year-round. Have you ever watched a bell pepper grow in a garden? It's kind of amazing. They start small, then they gain some length and width, and then the finale is when the robust color shines through the pale green. Depending on how long you let them ripen, you'll get red, orange, yellow, or green. But when you buy these in-store, you're paying a premium. So why not save some cash and grow them at home? A spicey member of the pepper family, jalapeño peppers are also cheaper to grow than they are to buy. Just make sure you give them direct access to sunlight as these guys love to sunbathe. Artichokes are another perennial gem. They are cheaper to grow, but they do need moist soil in order to thrive. Also, make sure you keep them free of surrounding weeds that could get in their way. Onions might not be a produce item that you feel like you're spending a lot on at the store. But just because you're used to a certain, fairly low price doesn't mean you need to pay it. Grow your own onions and you'll be saving money over time. Plus, if you plant scallions, they could be ready for eating in 20-30 days! You can grow these plants even if you don't have space for a garden. Start these plants in containers on a patio or balcony. Another factor to consider in selecting the most valuable things to grow is how much space is required per plant. Plants that take up less room work better in small gardens, and smaller plants allow more variety in whatever size garden you have to work with. The hardiness of plants and the climate that they need to grow must also be considered when deciding what to plant in your garden. It would not work out well to try to harvest a high value crop from a plant that will not grow in your climate. You can check your hardiness zone using a map available from the USDA and then check seed packets or listings in seed catalogs to make sure that the things you want to plant will grow in your area before you buy them. If you have more room available, you will be able to grow some of the larger plants such as squash, pumpkins, and large tomatoes.